With the Samsung Galaxy S6 edge storming out of the gates, we'll take a look at how a last year's flagship phablet - the Motorola & Google-machined Nexus 6 - compares to a product that's been through a year of innovation since its predecessor - the Galaxy S5 - was announced. The Galaxy S6 edge is unusually design-conscious for a Galaxy phone: it’s slim, lightweight, and made of premium materials (metal for the frame and glass on both front and back). With such build qualities, the utilitarian Nexus 6 barely stands a chance. It has a plastic shell and metal outer trim without anything all that special about them. Which isn't really a bad thing, as there are many fans of this understated look. Besides, Nexus devices were never made to impress the masses. They are for the spec enthusiasts and developers - their modest designs absolutely work for this crowd. As you can clearly see, the Galaxy S6 edge lacks those front-firing stereo speakers that crown the Nexus 6's upper and bottom bezels. It also lacks one more thing. With a 5.1-inch curved AMOLED screen with a 1440 x 2560-pixel (Quad HD) resolution at the front of the parade, the Galaxy S6 edge could realistically grab the mobile display crown of 2015. Not only is this screen impeccably sharp, but Samsung has improved the brightness levels too, with the screen reportedly reaching up to 600 nits! But the Nexus 6 is no slouch either! Not only it's a match for the Galaxy S6 edge's screen technology, it also plots it on a significantly larger area by diagonal - that's 6 inches of brilliant display you're getting! It doesn't have those eye-catching curves, and its glass cover is a fingerprint magnet, but it's really good for the most part. Still, Samsung's latest AMOLED panels are better in terms of brightness levels and color reproduction, so if you want the best display for your money, go with team Korea. 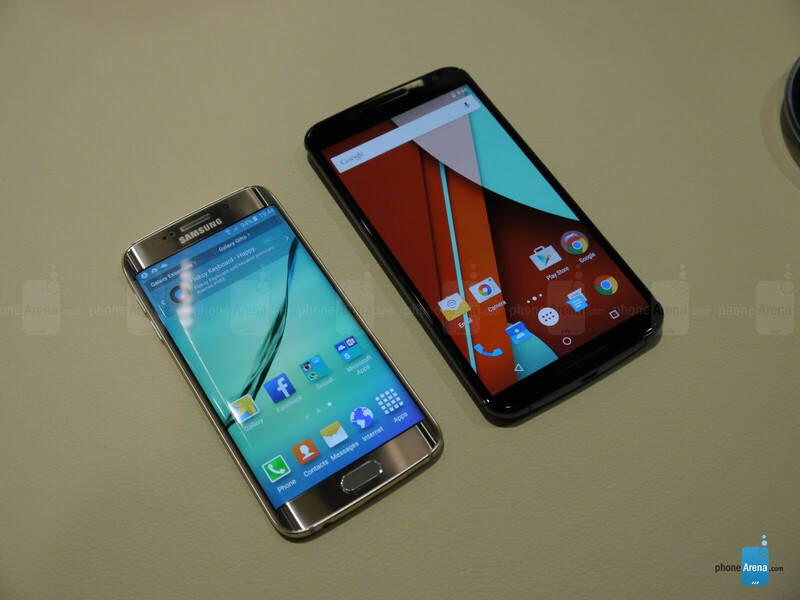 For the Galaxy S6 edge, Samsung put its TouchWiz Android interface on yet another diet. It seems even less cluttered now, more streamlined and overall cohesive. Of course, the typically Korean cheerful, jolly look to everything still stays. It's friendly, we like it. 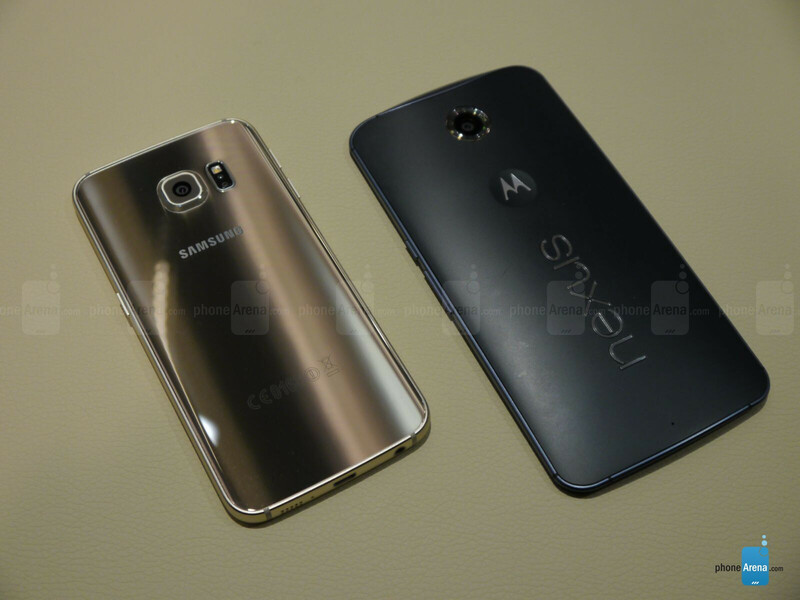 What about the Nexus 6? It was destined to run either Android as it came out of Google's fortress in Mountain View, or whatever you please - if you're savvy enough to tinker with custom ROMs and kernels. Pure stock Android 5.0 Lollipop is such a joy to use, but it's so squeaky-clean and transparent that you'd be forgiven if you wanted something more out there, you know? Either way, both smartphones pack enough basic apps to get you going with productivity and entertainment tasks, but keep in mind that Samsung has prepared a mobile payments system - Samsung Pay - to take over the United States and Korea with. The Nexus 6 doesn't have the fingerprint sensor or security platform (Samsung KNOX) to support this functionality. The Galaxy S6 edge features a 14nm octa-core chipset that is the first of its kind in the mobile industry, according to the company. Samsung did not say that it is using its homegrown Exynos 7420 processor, but we consider this a public secret at that point. It is paired with 3GB of LPDDR4 RAM and a powerful ARM Mali T760 GPU. Our first benchmarks have shown this configuration has seriously impressive capabilities, reporting excellent results in processing and graphics performance. The Nexus 6 too is a formidable piece of hardware. It runs on the Qualcomm Snapdragon 805 processor, which is still one of the most potent chipsets available right now. It's not the Snapdragon 810, and it doesn't obliterate AnTuTu quite like Samsung's processor did in our benchmarks, but it aces Quad-HD and 4K content and it will take quite a bit of punishment before you feel it slowing down. Storage-wise, the Galaxy S6 edge comes with 32GB of extremely fast UFS 2.0 flash storage, which will surely give it an edge (wink) against competing smartphones with respect to app and content loading times. The Nexus 6 doesn't have that blistering fast memory, but it has two times more of the stuff - it comes with 64GB as standard. Samsung is a strong player in the mobile camera department, and by the looks of it, the Galaxy S6 edge will be a photography force to be reckoned with! The camera resolution stays at 16 MP, but it sees the addition of HDR, infrared white balance, and tracking auto-focus for the video camera. Samsung also upgraded the camera module with a wide, F1.9 aperture that could deliver better low-light image quality than that of the Galaxy S5, whose aperture size was F2.2. In addition, the camera app itself now resides permanently in the smartphone's RAM memory, and launches in a near instant with a double-press of the home button. As for the front cam, it's a 5MP unit. The Nexus 6’s 13-megapixel camera is camera hardware in good light, as it features an f/2.0 aperture lens, optical image stabilization, dual-LED flash ring, 2-megapixel front camera, and up to UHD 4K video recording. Megapixels aside, this camera can definitely hold its own against Samsung's latest and greatest, coming up with detailed and color-accurate daylight photos, and featuring an HDR+ mode that helps it perform well in low light situations. Naturally, both cameras take 4K video as well, and tell you what, it looks great on those pixel-dense 2K displays! The Samsung Galaxy S6 edge packs a 2600mAh unit, which sounds a bit less reassuring than we'd like it to. However, Samsung is giving it a pretty good prognosis! It should be enough for 12 hours of Wi-Fi browsing, 11 hours of browsing over LTE, up to 13 hours of media playback, and up to 49 hours of music playback with the display turned off. But still, we'd rather let our proprietary battery test be the final authority on the matter. In addition, the Galaxy S6 edge comes with fully embedded wireless charging, working with any wireless pad on the market that supports WPC and PMA standards. Not only that, but Samsung also developed a fast wired charging solution that's able to give you 4 hours of usage after just 10 minutes on the charger. Once again, we'll have to see about that in practice. The Nexus 6 is a comparatively larger device with a comparatively larger battery - it's a 3220mAh unit that does a respectable job of powering this behemoth of a smartphone for 7 hours and 53 minutes of on-screen usage. It too has wireless charging as standard, and it comes with a charger that tops of the battery to the max in about a hour and a half. Honestly, we can't really imagine folks that walked away impressed with Samsung's Galaxy S6 edge going for a device as understated and bulky as the Nexus 6. On the other side, those who are happy with their Nexuses already will probably hold onto them for another year or two, as the phablet is pretty futureproof - even if it isn't going for full-on 64-bit processing. The Nexus 6 looks old now. I've squeezed out an Antutu score of 51291 out of my nexus 6. Stock device. Nexus 6 wasnt great at all... :C Nexus 4 and 5 were really great.